GENEVA, Dec 9, 2015 – The International Press Institute (IPI), Al Jazeera Media Network (AJMN), Geneva Global Media and the Geneva Press Club presented 9 December 2015 the International Declaration and Best Practices on the Promotion of Journalists Safety at an event organised in Geneva. The International Declaration, which was timely unveiled on the eve of International Human Rights Day, aims to reinforce existing international obligations and mechanisms related to journalists’ safety and contribute to the protection of journalists’ rights. The document is the outcome of an initiative of AJMN, IPI, the Africa Media Initiative (AMI) and the International News Safety Institute (INSI), which saw the participation of over 70 representatives of media organisations, press freedom and journalists’ groups, international organisations and independent experts, including Iqbal Khattak from Pakistan. The International Declaration highlights the existence of numerous international mechanisms aimed at ensuring journalists can practice their profession freely and without fear of retaliation. However, states’ failure to implement those mechanisms and fulfil their international obligations has turned journalism into an increasingly dangerous profession. In addition to reminding states of their responsibilities, the International Declaration also presents a set of best practices that media organisations should consider in an attempt to limit the dangers of the profession. There is widespread agreement that states hold sole responsibility for preventing attacks against journalists – attacks that are often a direct consequence of widespread impunity. However, the experts who contributed to drafting the Declaration noted the importance of raising awareness about best practices related to in-house policies and mechanisms aimed at assessing and controlling the risks that journalists face. 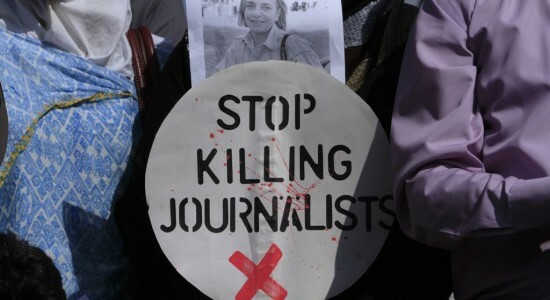 At least 73 journalists have been killed in 2015, according to IPI’s Death Watch. That tally includes journalists and media staff who were deliberately targeted because of their profession or who lost their lives while on assignment. Click below link to download PDF version of declaration.